The Kidney Foundation of Ohio hosted a free, community event in honor of World Kidney Day on Thursday, March 14 at the YWCA Greater Cleveland. Event attendees enjoyed lunch, massages, chair yoga, discussion about kidney health, and visited with local health organizations. 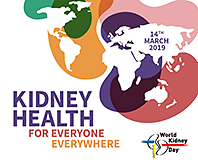 Information about World Kidney Day 2020 will become available at the end of the year. Throughout the year, volunteers are needed to assist staff with clerical tasks. Individuals may be asked to answer phones, complete computer tasks, or prepare bulk mailings. Volunteers should be comfortable answering the phone and have basic knowledge of Microsoft Office. Work takes place within the office on Mondays through Fridays 8:30 am-4:30 pm. Several special events take place throughout the year to assist in fundraising for our patient service programs. Events consist of a gala, golf outing, summer event, renal symposium and walk & 5K. Volunteers are needed to serve on the planning committees and for event day activities. Prior event volunteer experience is preferred but not required. Volunteers are needed to participate in community-wide health events throughout the year to educate those at risk for kidney disease. Individuals can assist by distributing literature and educating the public on the Foundation's programs and services. Healthcare professionals are also needed to assist in conducting blood pressure screenings. Personal stories and experiences are a great way for others to learn about Chronic Kidney Disease and related disorders. Share your story so that someone else can learn about dialysis or transplantation. If you have utilized our services or are connected to the KFO, let us know so we can highlight your story and teach others about the Foundation. For more volunteer details, contact the Kidney Foundation of Ohio at (216) 771-2700. Contact Annette Fetter at (216) 771-2700 or afetter@kfohio.org for more information.